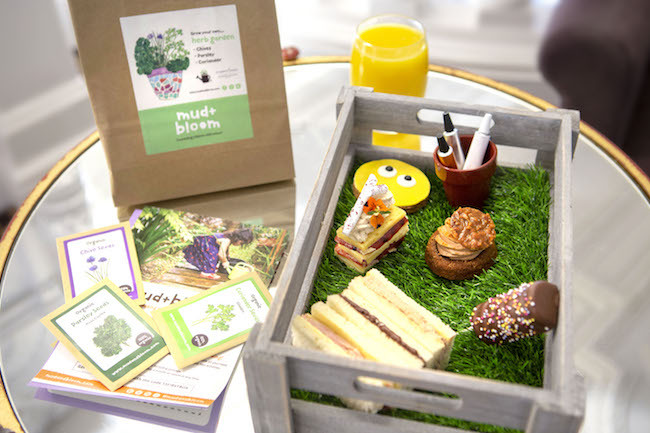 Every child who attends this delightful tea receives a special Mud & Bloom gardening pack to use after their visit, to encourage them to spend more time outdoors this spring. Sandwich fillings include tuna mayonnaise, Nutella, and honey roast ham and cheddar, Nutella, with a batch of freshly baked scones also included. Among the sweet treats on the menu, expect to see a delicious marshmallow dipped in milk chocolate, banana sponge with chocolate and caramelised peanuts, and an apple, blackberry and custard slice, plus a ‘decorate your own gingerbread’ activity to keep your little ones entertained. Available on weekends or during school holidays. Go grand with this traditional English experience opposite the Royal Mews of Buckingham Palace. 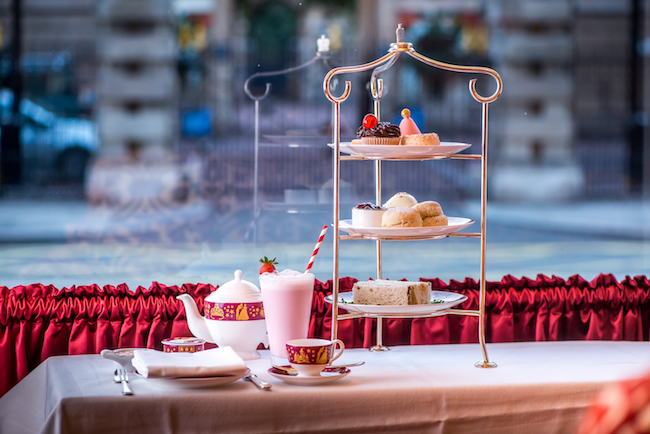 Under-12s will love the Little Prince and Princess Afternoon Tea, which features a selection of delicious finger sandwiches, indulgent pastries, and a choice of either a milkshake, hot chocolate or soft drink. Expect plenty of old favourites in the sandwich selection, with ham and cheese, chocolate Nutella and strawberry jam and peanut butter for little ones, and salmon and cream cheese, egg and watercress and coronation chicken for the adults. The warm baked scones are truly fantastic – coming both plain and in a delectable rich chocolate chip flavour – while highlights on the dessert menu include the gin and tonic cheesecake for mum and dad, and the Queens Jammy dodger biscuits for the kids. 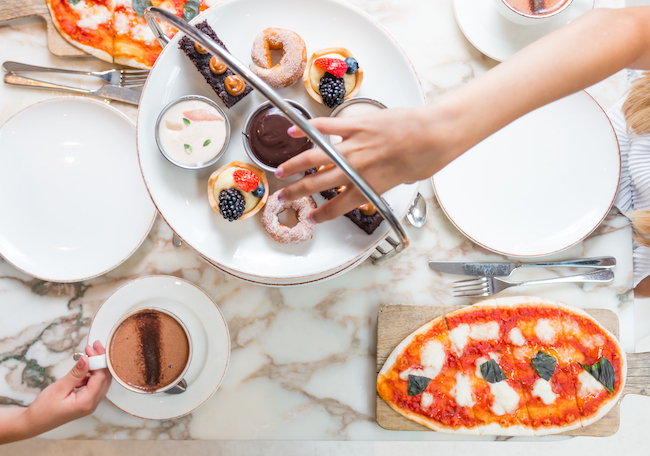 An afternoon tea with a twist, the El Dolce Nino menu at this stylish Seven Dials eatery is packed with delicious Italian classics. Unlike any other afternoon tea we’ve ever been to, little ones start their experience here with a gorgeous thinly-based margharita pizza, while grown-ups are served up a crunchy trio of bruschetta, topped with parmigiana, cherry tomato, spinach and soft cheese. Next up is a selection of warm freshly-baked scones, which are wonderfully fluffy on the inside and come with a helping of vanilla mascarpone and orange and nectarine preserve. Desserts include churros with chocolate sauce, flourless chocolate and orange cake, and a fresh fruit tartlet, all polished off with bottomless supplies of tea or Rococo hot chocolate. Bellisimo! 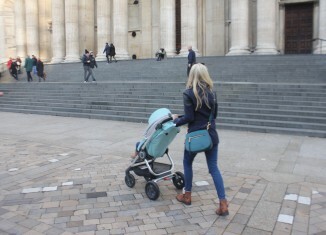 If you’re having a family day out in the capital, why not pop by this iconic London venue while you’re there? Its fantastic location on the banks of the River Thames is unrivalled, and there’s much to be said for the scenic views, too. 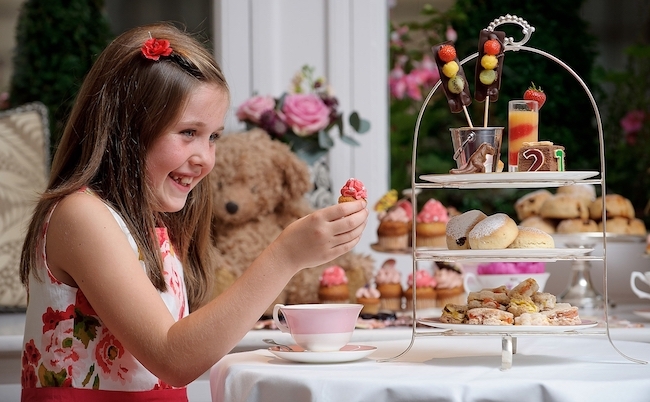 Described as a ‘tea party for little ladies and gents’, the children’s ‘Mini Tea’ at The Royal Horseguards features a selection of fun-shaped sandwiches, themed pastries, plus freshly baked fruit and cinnamon scones. Adults can expect all the usual classics with a choice of delicious blended teas, while smaller guests have the option of a Baby Chai latte, Babyccino or fruit juice. 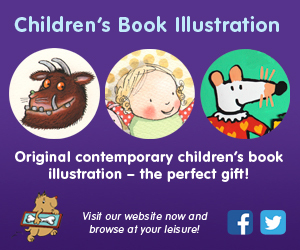 Plus, they’ll also receive a fun colouring book and puzzle to keep them amused throughout the experience. 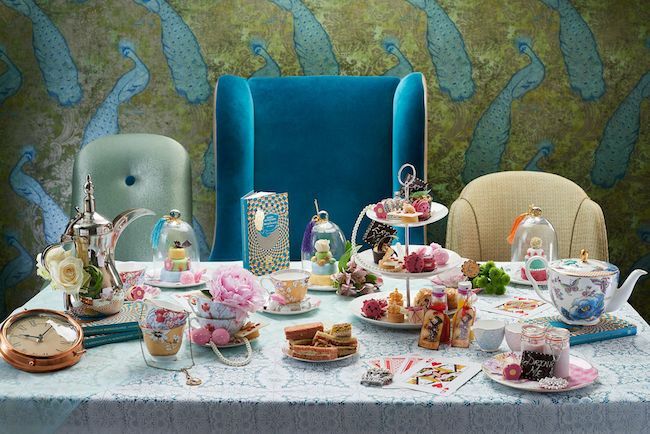 Fans of the Lewis Carroll classic will adore this colourful themed afternoon tea at Taj Buckingham Gate, which invites you down the rabbit hole and into the magical world of wonderland. Expect a quirky and extravagant selection of cakes and pastries inspired by Alice’s adventures, including ‘Queen of Hearts’ Mango Tarts, ‘Drink Me’ Strawberry Potion, White Chocolate Mousse Teacups and and Pocket Watch Macaroons. Ideal for older children, or those with a more adventurous palate, finger sandwich fillings vary from chicken and sultana on carrot bread, to tuna mayonnaise, cucumber and cream cheese, and Cornish Yarg and tomato with redcurrant jelly. And for an added half-term treat, you can also purchase a special hardback copy of the 150th anniversary celebration edition of Alice’s Adventures in Wonderland, for an additional £12. 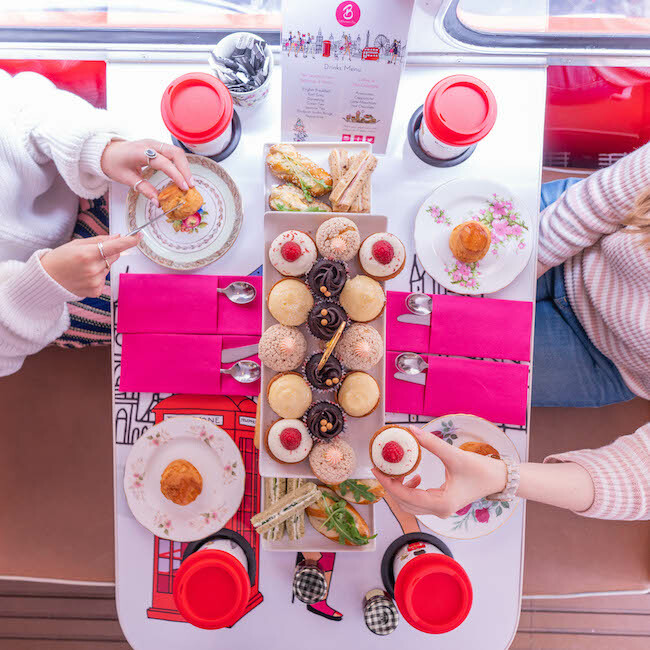 This unique experience will see you travel around the capital on a Routemaster bus, as you delve into a delicious selection of teas, cakes, sandwiches and pastries. Departing from either Victoria Station or Northumberland Avenue, you’ll tick off a host of London’s best-loved landmarks on your travels, from Big Ben, The Houses of Parliament, and Westminster Abbey, to Hyde Park, Marble Arch, Downing Street, and many more. Smoked salmon pretzels and pastrami burgers are among some of the more unusual savoury treats on the menu, with a vanilla and raspberry jam choux, chocolate mini cupcake and Queen sable and cream cheese mousse within the assortment of desserts. And of course, who can forget the freshly baked scones, accompanied by clotted cream and jam? 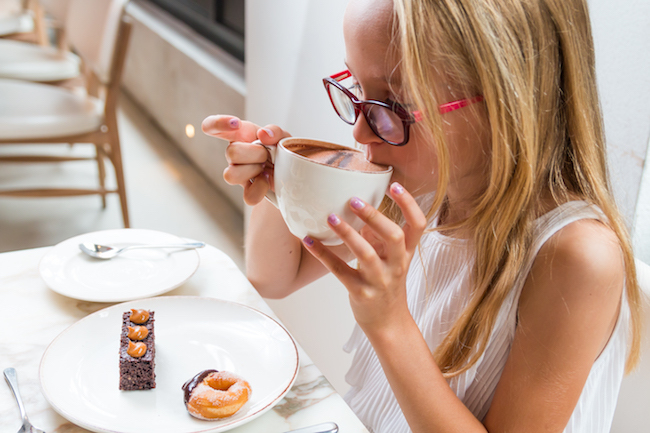 If tea doesn’t take their fancy, hot chocolate is also available for children – though it’s worth noting that this afternoon tea is only available to little ones aged five and over. 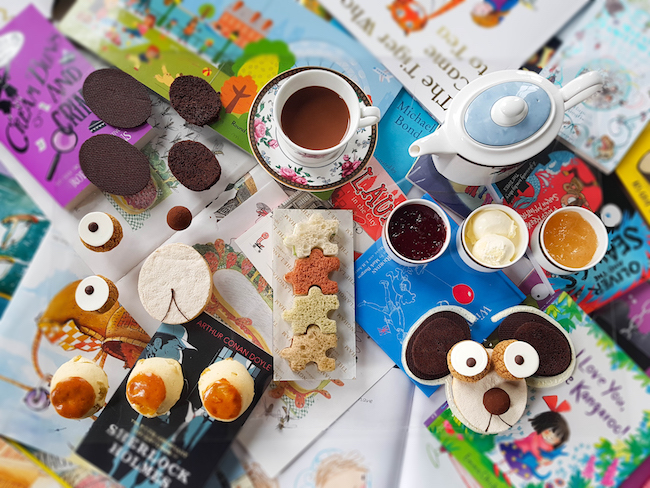 Ideal for little bookworms, The Langham’s tea experience is hosted in partnership with Daunt Books, which means mini diners can choose their own new book before tucking into a variety of tasty treats. Highlights on the menu include jigsaw-shaped sandwiches and a chocolate cake that can be assembled into the shape of dog, as well as a delicious selection of scones. Where better for memorable culinary experience than the spectacular Sunborn London? 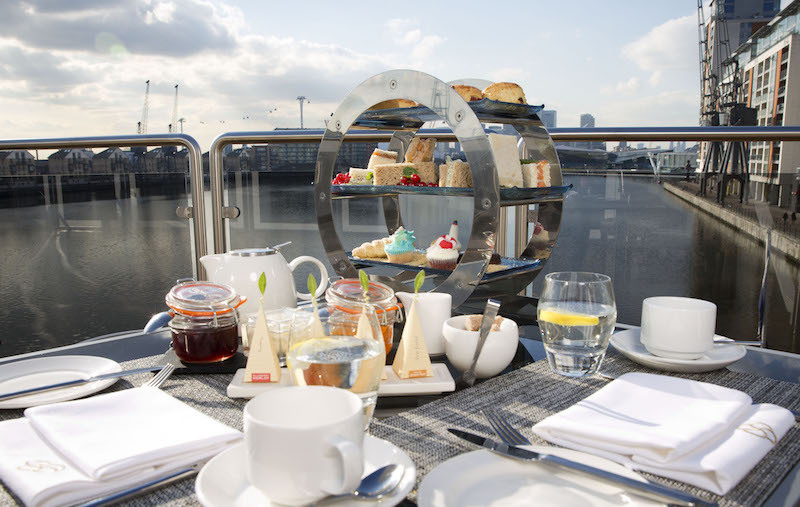 Moored in the Royal Docks near the ExCel Centre, this beautiful yacht is home to a brand new afternoon tea menu that little ones are sure to love. Look out for popular sandwich fillings such as egg mayonnaise, ham and mustard, cheddar cheese and chutney, each delicately pressed between layers of soft bread. Children also have a choice of hot chocolate and soft drinks, plus the extensive tea selection. Scones are a given, of course, and the sweet bites are something special, too: salted caramel Belgian brownies, lemon sherbet macaroons, berry Bakewell tarts, and rhubarb and vanilla panacotta – simply scrumptious.